On this week's episode, the gang goes to court with Demi Moore and Alec Baldwin in the ridiculous legal thriller, The Juror! Why does Alec Baldwin's mafia fixer character have a Jackal-esque nickname? Could Anne Heche be a bigger Dead Meat side character? And what is with all the box puns? PLUS: That. Dragon. Video game. 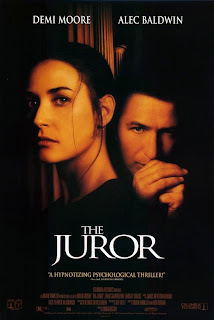 The Juror stars Demi Moore, Alec Baldwin, Joseph Gordon-Levitt, Anne Heche, Tony Lo Bianco, Lindsay Crouse, Michael Rispoli and the legendary James Gandolfini; directed by Brian Gibson. Theres a 'Deus Ex Mafia' in "The Italian Job" as well. 25 cents on Con Air. I can't think of another "We Love Movies" Cage flick that would also be deserving of WHM treatment. An estimated Cipto Junaedy one of every two hundred pregnancies are estimated to be ectopic, or extrauterine. This occurs when pregnancy takes place tips hamil alami outside the uterus, or womb, where pregnancy is supposed to take place. An ectopic pregnancy will usually happen in the fallopian tubes, and can either resolve naturally much like a miscarriage, or may cause a whole range of ingin cepat hamil symptoms which will need to be dealt with in a medical setting. If left untreated, complications from an ectopic pregnancy can be life threatening and require surgery. If you the symptoms of ectopic pregnancy are caught cara supaya cepat hamil soon enough, other treatment options may also be available, but surgery is oftentimes required if such a pregnancy does not resolve itself. Thank you for sharing. I'm always looking for upcycles like this.